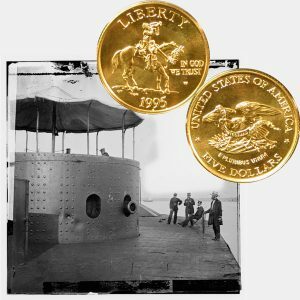 Today, the Civil War Battlefield Commemorative Gold Five-Dollar Coin remembers when the first federal ironclad launched on January 30, 1862. Acquisition. — Built by contract with John Ericsson at Green Point, L. I. Launched January 30, 1802. Class: Monitor; screw steamer; iron and wood; single turret. Rate, rig, etc. : Original type of turreted vessel. Dimensions. — Length, 172′ ; beam, 41′ 6″ : depth, 11′ 4″. Draft. — Just after being launched; forward, 7′ 3″; aft, 8′ 1″ (10′ 6″). Engines. — Double trunk, cylinders (2 in 1 casting); 36″ diameter, 27″ stroke. Boilers. — Two; return tube “box” boilers. Battery. — 2 Xl-inch guns in turret. Disposition. — Foundered off Hatteras, December 31, 1862, Commander J. P. Bankhead in command. Remarks. — Cost of articles furnished to her was $560.35. Had famous engagement with C. S. S. Merrimack in Hampton Roads, March 9. 1862. First engagement of ironclads. Under the act of Congress passed last Summer appropriating $1,500,000 for iron-clad vessels for the Navy, Captain J. Ericsson, the world-renowned inventor of the caloric engine, presented proposals for a battery, to be launched within one hundred working days from the date of the contract, the impregnability of which should be tested before the heaviest guns of the enemy, and at the shortest range. The contract was signed in October, and on the one-hundred-and-first working day thereafter the Monitor was launched from the Continental Iron Works at Greenpoint, where she was constructed by C. S. Bushnell & Co., under the superintendence of Thomas F. Howland of Brooklyn. Externally she presents to the fire of the enemy’s guns a hull rising but about eighteen inches above the water, and a sort of Martello tower, twenty feet in diameter, and ten feet high. The smoke-stack during action is lowered into the hold, it being made with telescopic slides. The hull is sharp at both ends, the bow projecting and coming to a point at an angle of eighty degrees to the vertical line. It is flat-bottomed, six and a half feet in depth, one hundred and twenty-four feet long, thirty-four feet wide at the top, and is built of light three-eighth inch iron. Another, or upper hull, rests on this with perpendicular sides and sharp ends, five feet high, forty feet four inches wide, one hundred and seventy-four feet long, extending over the sides of the lower hull three feet seven inches, and over each end twenty-five feet, thus serving as a protection to the propeller, rudder and anchor. The sides of the upper hull are composed of an inner guard of iorn, a wall of white oak thirty inches thick, covered with iron armor six inches thick. When in readiness for action, the lower hull is totally immersed, andthe upper one is sunk 3 feet 6 inches, leaving only 18 inches above water. The interior is open to the bottom like a sloop, the deck, which is bomb-proof, coming flush with the top of the upper hull. No railing or bulwark of any kind appears above the deck, and the only things exposed are the turret or citadel, the wheel-house, and the box crowning the smoke-stack. The inclination of the lower hull is such that a ball to strike it in any part must pass through at least 25 feet of water, and then strike an inclined iron surface at an angle of about 10 degrees. In the event of the enemy boarding the battery they can do no harm, as the only entrance is at the top of the turret or citadel, which cannot easily be scaled, and even then only one man at a time can descend into the hull. This turret is a revolving, bomb-proof fort, and mounts two 11-inch guns. It is protected by eight thicknesses of inch iron, overlapping so that at no one spot is there more than one inch thickness of joint. A shell-proof flat roof, of perforated plate iron, placed on forged beams, inserted six inches down the cylinder, covers the top. The sliding hatch in this cover is perforated to give light, and for musketry fire in case the battery is boarded. A spur-wheel, 6.5 inches in diameter, moved by a double cylinder engine turns the turret, guns and all, a rod connected with the running gear of the engine enabling the gunner to control the aim. The guns move in forged-iron slides across the turret, the carriages being made to fit them accurately. These guns were furnished with 400 wrought-iron shot by the Novelty Works, each ball weighing 184 pounds and costing $47. The balls were made by forging square blocks of iron, which were afterward turned in the lathe. Cast-iron shot would break against such a vessel as the Merrimac, and these shot were forged for the especial purpose of smashing through her sides. Lieut. Worden intended, in case the Merrimac did not come out, to go into Norfolk harbor and lay his vessel alongside of her there. She has saved him the trouble. Lieutenant-Commanding, John S. Worden; Lieutenant and Executive Officer, S. D. Green, Acting Masters, L. N. Stodder and J. W. Webber; Acting Assistant Paymaster, Wm. F. Keeler, Acting Assistant Surgeion, D. C. Logue; First Assistant Engineer, Isaac Newton; Second Assistant, Albert B. Campbell; Third Assistant, R. W. Sands and M. T. Sunstron; Acting Master’s Mate, Geo. Frederickson. The Civil War Battlefield Commemorative Gold Five-Dollar Coin shows with an image of the U.S.S. Monitor, circa 1862.